This is where we hide all of our favorite staff creations and retired menu items. 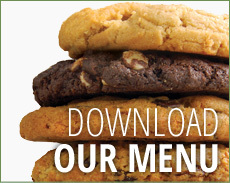 Because you can customize any of our menu items, the options are limitless. Thinly sliced ham, house cooked eggs, and Swiss cheese served on a freshly baked croissant. A side of our freshly scrambled eggs. Choose toppings from ANY sandwich or pizza! Triple decker of Shiner Bock beer bread with ham, bacon, pickles, Swiss cheese, honey and dijon mustards baked in our stone oven. Jalapeño Cheese bread, cheddar, turkey, avocado, spinach, tomatoes with hot sauce and baked in our stone oven. Fresh mozzarella, basil and bacon on sun-dried tomato herb bread with tomatoes and tomato aioli. Spinach & Feta Cheese bread with pesto, spinach, artichokes, feta and sliced chicken breast. Kalamata Olive & Rosemary bread with mayonnaise, spinach, tomatoes, turkey, bacon and provolone cheese. Roast beef, bacon and cheddar cheese with spinach, roasted red peppers, mayonnaise and Dijon mustard on sourdough bread. Layers of spinach, artichoke hearts and roasted red peppers with goat cheese and balsamic glaze on multi-grain bread. Ham, turkey, bacon and Swiss cheese with tomatoes, lettuce and Dijon mustard on a crusty French baguette. Thin slices of smoked salmon served on a bagel with cream cheese, capers, and red onions. Our Club Bleu toasted up in the oven. Our B.L.T. toasted up in the oven. Our Blue Abyss toasted up in the oven. Our Blue Bird toasted up in the oven. Our Powder Blue toasted up in the oven. Our Tejas Blue toasted up in the oven. Our Earl toasted up in the oven. Our Caprese toasted up in the oven. Choose toppings from ANY sandwich or pizza! Oven-baked Sandwich. Field greens, cucumbers, tomatoes, croutons and ranch dressing. Sliced chicken breast, corn cob smoked bacon, blue cheese, red onions and tomatoes with romaine and field greens dressed with vinaigrette. Serves twelve to fifteen as a side. Romaine lettuce with smoked salmon, red onions, sun-dried tomatoes, capers and Parmesan cheese dressed with Caesar dressing. A 12 oz. cup of our delicious, fresh house made chicken salad. A 12 oz. cup of our delicious, fresh house made tuna salad. Choose from our retired sandwiches. Some days we sell out fast, and some days we don't. If there are day old breads in the store, this is how to buy them - but we might need to call you back to say they're all gone. An entire sandwich loaf of bread. 160 ounces of hot water served with a variety of individual tea bags, cups, lids, lemons, and sweeteners. Twelve servings. A 10 pound bag of ice. 1 dozen of our mini cookies wrapped individually. Assorted flavors. Entry for the free bakery tour. For Blue Baker staff use only. Cost for 1 child to attend a paid bakery tour. For Blue Baker staff use only.